Based on the transparency notifications received by Galapagos NV under Belgian law and the statements of acquisition of beneficial ownership filed on Schedule 13G with the U.S. Securities and Exchange Commission under U.S. securities law, the shareholders owning 5% or more of Galapagos NV’s shares on 31 December 2016 were Gilead Biopharmaceutics Ireland Unlimited Company (6,760,701 shares or 14.62%), FMR LLC (4,606,507 shares or 9.96%), and Van Herk Investments B.V. (3,943,150 shares or 8.52%). At the end of 2016, the CEO owned 628,289 shares of Galapagos NV and 706,874 warrants. The other members of the executive committee held an aggregate of 35,352 shares and 970,000 warrants. The other members of the board held an aggregate of 49,844 shares and 165,240 warrants. Each warrant entitles its holder to subscribe to one share of Galapagos NV. On the date of this report, Galapagos NV had no knowledge of the existence of any shareholders’ agreements between its shareholders. On 16 December 2015, we signed an exclusive license and collaboration agreement to develop and commercialize filgotinib in multiple indications with Gilead Biopharmaceutics Ireland Unlimited Company. Under the terms of the collaboration, Gilead is primarily responsible for development and for seeking regulatory approval of the licensed product. We are required to use commercially reasonable efforts as requested by Gilead to assist Gilead with certain development activities. In addition, we agreed on a 20-80 cost split for development costs of the licensed product, i.e. we will bear 20% of all development costs. 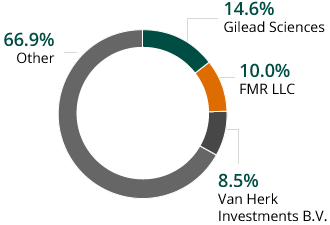 In the framework of the closing of the transaction on 19 January 2016, Gilead paid a license fee of $300 million (or €275.6 million) and made a $425 million (or €392 million) equity investment in Galapagos NV by subscribing to new shares at a price of €58 per share, including issuance premium. This resulted in Gilead owning 6,760,701 ordinary shares of Galapagos NV, representing 14.75% of the then outstanding share capital of Galapagos. In the framework of this transaction, the parties agreed to a lock-up arrangement and a standstill arrangement.